Switzerland last month recorded the warmest December on record. The arrival of snow in the Alps has come as a welcome relief for holidaymakers and ski workers alike. But why did the snow come so late, and is this something that we should begin to expect in future years? Alpine ski resorts had their worst Christmas for decades. A lack of snow in the run up to, and during, the December left skiers facing thin, icy slopes at a time of year when they could usually expect excellent conditions. Many resorts were almost completely reliant on snow-making equipment – if they were lucky. Some ski areas even resorted to using helicopters to stock up from “snow quarries”. It all started rather promisingly. November 2015 saw the development of a low pressure system over north-eastern Europe, which drew cold air over the Alps, bringing lots of snow and great early season skiing conditions. However, as December approached, an area of high pressure began to dominate and conditions took a nose-dive. In a high pressure system, dense air descends to Earth’s surface, preventing the formation of clouds and reducing the possibility of precipitation. Anyone who was in the Alps just before Christmas will be able to confirm the beautiful clear, cloud-free skies (I had the sun burn to prove it). High pressure systems in Europe are also associated with a clockwise atmospheric rotation and this forced warmer air from the south-west over the region. These conditions prevailed throughout much of December with the net result that the early snow began to melt and was not replaced; making snow artificially was not always possible as this too requires sub-zero temperatures. Switzerland even had its warmest December on record. For an immediate “cause” of these conditions, Europe’s snow lovers should look towards the world’s two largest oceans. Firstly, the Atlantic. A large difference in atmospheric pressure between the mid-Atlantic around the Azores (high pressure), and the north Atlantic around Iceland (low) has forced stronger than normal south-westerly winds towards the Alps, stimulating higher pressures in the region. The fluctuation in pressure difference over time between the “Azores high” and the “Icelandic low” is known as the North Atlantic Oscillation (NAO), measured by the NAO Index. 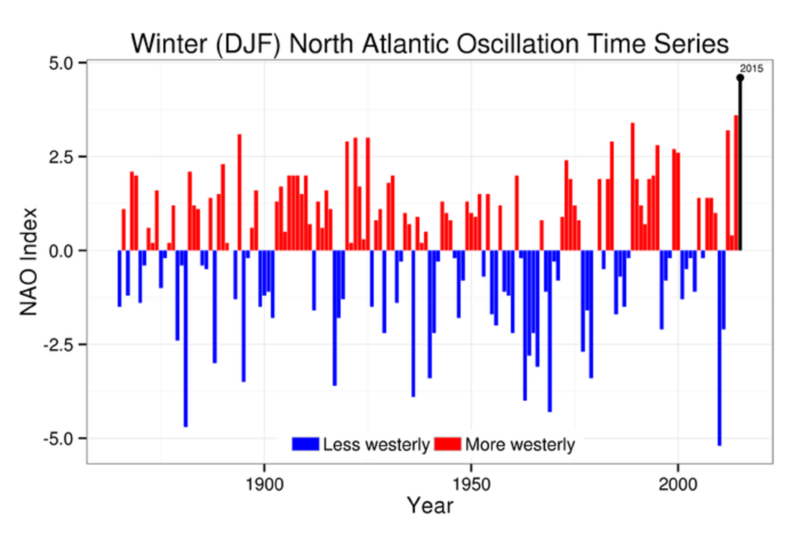 Studies have confirmed an inverse relationship between the index and snow in Europe, with a high NAOI often being attributed to warmer and/or drier conditions. Meanwhile in the Pacific there’s a particularly intense El Niño at the moment. While no direct links between El Niño and snowfall in the Alps have been confirmed, it is known to impact the climate in Europe through what are termed “teleconnections” – the relationships between atmospheric phenomena that are often thousands of kilometres apart. As such, there is every possibility that this has added to the “anomalies” we have witnessed this year. Here, however, I use the term “anomaly” cautiously as last year also saw similar delayed snowfall – the anomaly this year is therefore not all that anomalous. 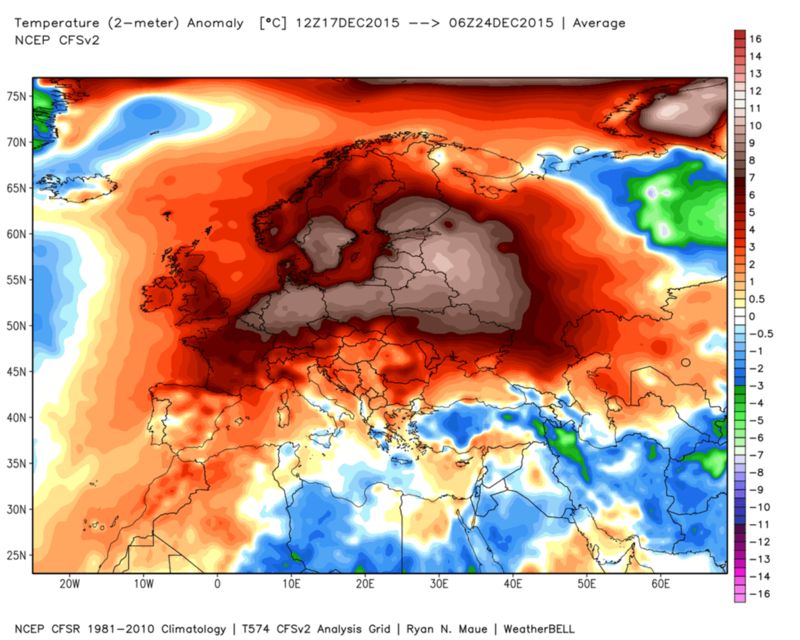 When examined as a whole, 2014 was the warmest ever year on record in Europe, with 2015 coming in second. Given the third warmest year on record was also in the recent past (2007) these observations would appear to corroborate other evidence of global warming and might, as such, strike fear into the hearts of Europe’s skiers. But any trends are far from clear cut: 2012-13, for example, saw an early, and season-long, bumper snowfall. Academic studies have also found interesting but different patterns such as decades-long variations in Alpine snow since the 1860s, and a decrease in snow-season length from the 1930s to the 1990s, caused not by snow first falling later in the year but by earlier melting in the spring. So what for the future? Is this a temporary blip, or a hint at what we can expect in the future? Well no one really knows for sure. Predicting weather for the next few days is no easy task, so predicting whether the delayed snow falls of late will continue is not something we can do with a high degree of certainty. What is often forgotten too, is that the climate we experience today has been changing for millions of years, so fears of long-term changes based on just a few years of data need to be put into perspective. However, if the climate continues to warm, as is current scientific consensus, then skiing seasons may indeed shorten, or be displaced, particularly at lower altitude resorts. And what is the prospect for the next few weeks? Well in the short term, more snow is expected but as we move into mid-January, forecast models show there may be a brief return to high pressure conditions before optimal conditions reappear in a few weeks. My advice: get on the piste now while you can.